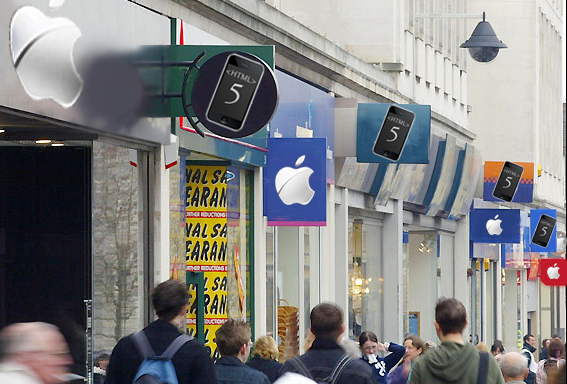 ← Apple iTunes – the only place to shop… literally? Following on from my post “Apple iTunes – the only place to shop… literally?”, it would appear that my predictions about large brands rushing to release HTML5 versions of their stores is starting to happen, only much quicker than I expected. Both Amazon and Wal-Mart recently launched excellent new HTML5 stores that reach iPad and iPhone owners without being subject to Apple rules and their 30% cut. This has been nicely documented in this article by Benny Evangelista at the San Francisco Chronicle. Wal-Mart now has an iPad version of its Vudu online video streaming service that uses the latest mobile web technology to browse and buy movies. While Amazon, who were forced to remove the popular book store from their iOS Kindle app about a week ago, unveiled their new Kindle Cloud Reader. This makes it easy for customers to purchase Kindle books directly from their iPhone or iPad, with no iTunes in sight. I’m sure we will see many more examples of this in the coming months. This entry was posted in app store, Apple, html5, Kindle and tagged HTML5, mobile commerce. Bookmark the permalink.